Android devices can be configured to store Gmail accounts. You can have more than one Gmail account set up on your Android device. Sometimes you may want to remove an old account from your device when you no longer want to use it on the device or completely remove your Gmail account(s) if you want to give away your device as a present to a friend. Or you have met some exceptional case, for example, you should return Samsung Note7 because its battery may cause fire, you should delete the important email account. 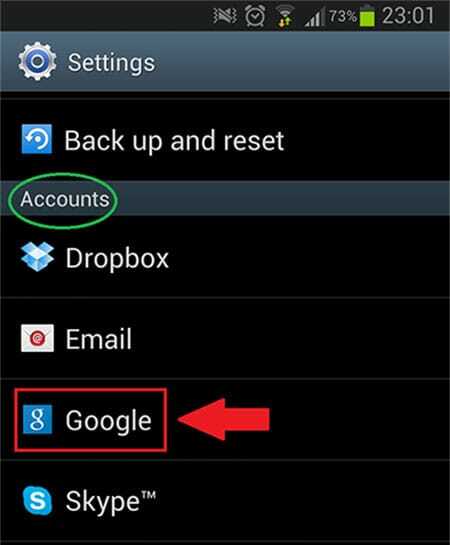 For whatever reason, here is the complete guide on how to delete a Gmail account on Android. [Update] Since the deleted data might be permanently deleted, so please backup Android to PC to avoid losing important data by accident. To delete a Gmail account from Android, you have two options - deleting individual Gmail accounts from the device setting menu, and doing a restore (hard reset) on the device. The first approach is recommended when you want to remove only Gmail from your Android device. The second option is essential when you want to restore your device to factory settings and remove all saved data and documents. This option comes handy if you want to give away your device. Step 1. Go to your Android menu, then select "Settings". Under settings, tap on "Accounts", then "Google". At this point, you will be prompted to choose the account you want to delete. Tap to select the account you want to delete. Step 2. After selecting the account, on the screen that comes up, tap on the "menu" icon, on the top right corner of the screen. Select "Remove Account". Clicking this option gives you a confirmation screen. Step 3. Confirm Account deletion on the screen that appears. You need to tap on the "Remove Account" option. At this point, your Gmail account and all related services to that account will be removed from your Android (Samsung Galaxy Note 7 included) device. You can reset your Android device to wipe out everything saved on it. There are two ways you can achieve this, i.e. by use of the settings menu and resetting using "Recovery Mode" at boot. Go to your Android menu, then select "Settings". Under settings, tap on "Accounts", then "Google". At this point, you will be prompted to choose the account you want to delete. Tap to select the account you want to delete. In recovery mode, the device can be reset without having to boot up. It is much simpler and convenient. To use this method, you need to ensure your phone/tablet is off. Then hold down the combination of "Power + Volume-", "Power+Volume+", "Power+Home", or "Power+Back"depending on your device model. You can search online for the right combination to use for your device. 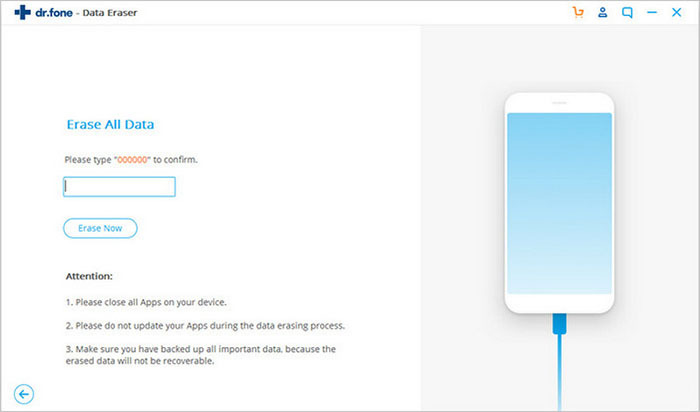 At the recovery screen, choose "wipe data/factory reset" to restore your device. Refer to the image below. The erasure methods above only delete data from the device. If you really want to permanently destroy all data on your Android device, you will need to employ a software that can access the device and delete data securely. For this purpose, we recommend the iSkysoft Toolbox – Android Data Eraser. 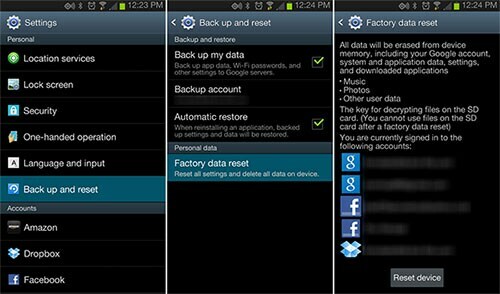 This software is purposely created for erasing and wiping off data from Android devices. 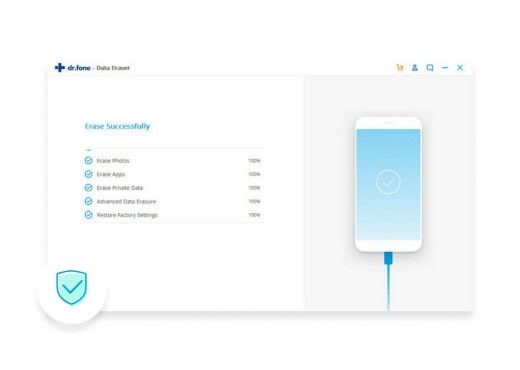 Data that has been erased by the iSkysoft Toolbox – Android Data Eraser cannot be recovered whatsoever, making it ideal for the purpose if you want to keep your privacy. 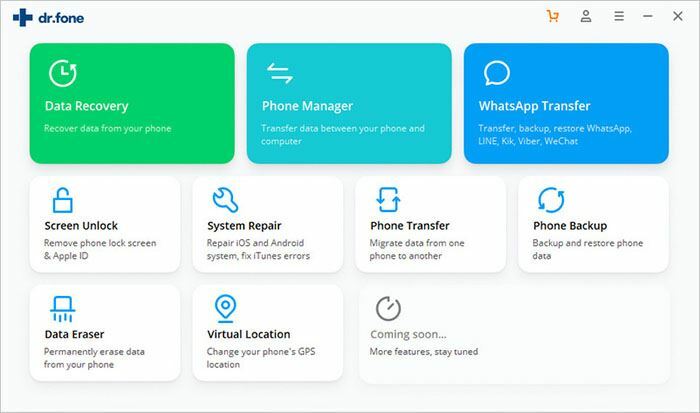 You need to install the software, connect your Android (including Samsung Galaxy Note7) device, and you are ready to erase your device. By using the iSkysoft Toolbox - Android Data Eraser, your data is deleted including the file signatures to ensure total privacy. It wipes off deleted data from device. 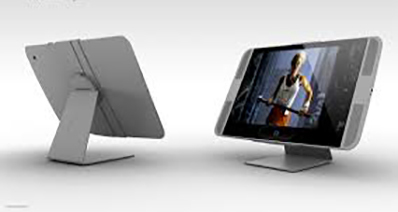 All deleted data on a device can be recovered using recovery software. The iSkysoft Toolbox - Android Data Eraser protects you by wiping off such space to ensure that no data can be recovered from previously deleted files. After erasing your device, you can safely transfer it by gifting somebody or selling it. It supports every Android phones and tablets. Launch iSkysoft Toolbox for Android once you have installed it on your computer. From the main window of the software, please select "Data Erase" on the top left corner. Now connect your Android device to the computer with a USB cable. 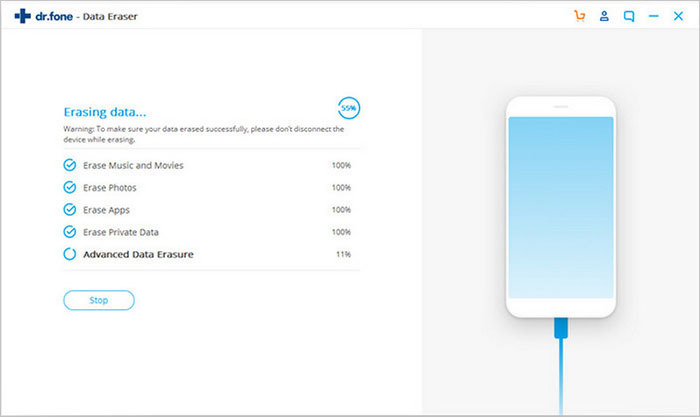 When you have entered the "Data Erase" interface, you can see there is a "Erase All Data" button. Now click it to continue the process. In the next interface, you will required to enter "delete" in the blank box, letting the software know that you are ready to perform the erasing process. Then click "Erase Now". 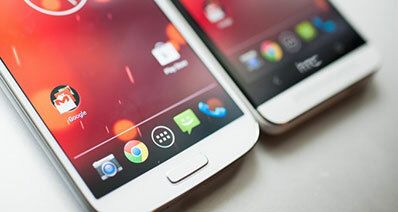 Now you can see the software is erasing everything on your Android device. The data wiped by this software can NOT be recovered by any other software. Last but not least, to make the process completed, you will have to perform the "Factory Data Reset" as the guidance shows by the software. After that, everything on your Android device have been deleted completely and no one can ever recover it! Let's try this software! 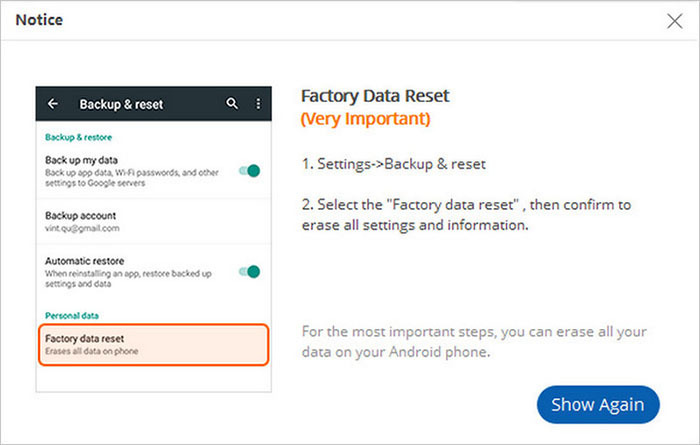 [Update] If your data is not deleted with iSkysfot Android Eraser, then you still remain an opportunity to restore data from Android directly. But please be noted that this can also be operated by others. So you'd better to ensure your data is permanently erased if you're planning to give up it.